Last year I had an exhibition in London that mixed two things I love – yoga and art. What more could I ask for? 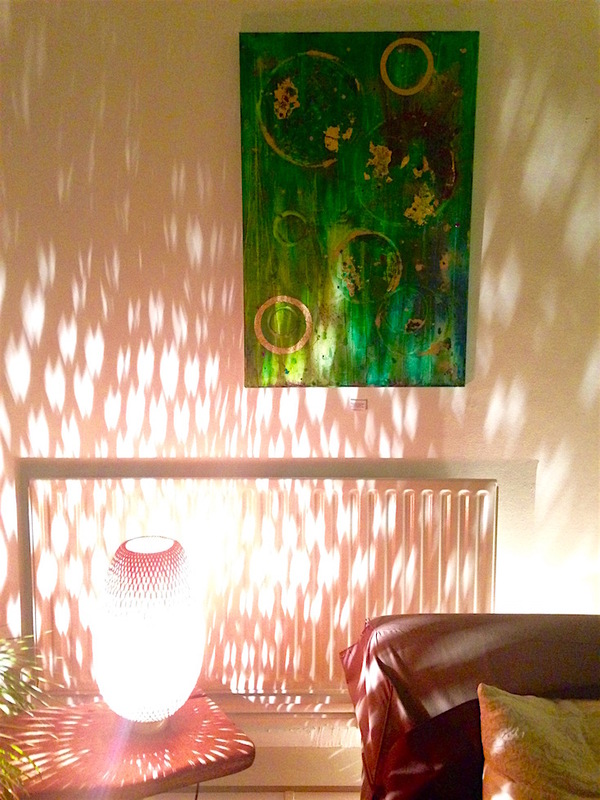 A small dream came true – my work was on display in a yoga centre. 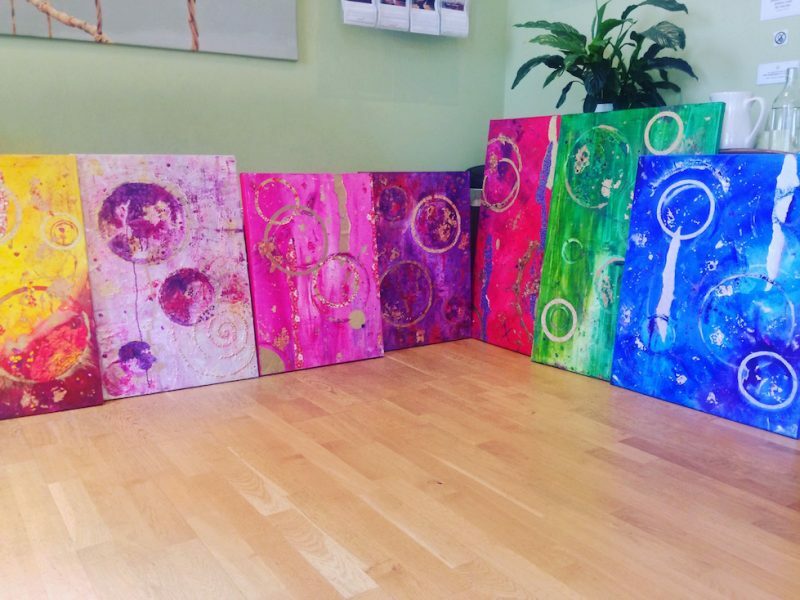 It was my longest exhibition and took place at at the wonderful Evolve Wellness Centre, a relaxing and airy venue in a South Kensington mews in London. Apart from brightening up the building I sold a few pieces, so all parties were happy. My work went up on the walls in September 2015 until May 2017, so it’s a great addition to my artist CV. Yoga’s a great way to start the day: While I do love going to classes, practising at home is more convenient when I’m painting. I signed up to Do Yoga With Me and as a result I can keep up my practice in the comfort of my own home. It helps me focus, especially if I haven’t had as much sleep as I’d like. Post-yoga relaxation or meditation is inspirational. I often draw the colours and textures of my abstract works from these times. And best of all – I can keep my yoga gear on to work! 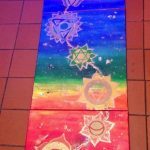 The jewel-like colours I choose for my paintings are frequently influenced by the seven main chakras. These are energy centres aligned along the spine and their colourful symbolism makes for great inspiration. Chakra itself means wheel or cycle, each one is a different colour and represents a different area of the body (Anahata, for example, is green and is situated at the heart). The “wheels” themselves bridge the energetic and physical bodies, corresponding to various emotions and stimuli. Additionally, there are various yoga poses that go with each. When you see a depiction of a chakra, you’ll see a circular symbol with petals around the edge. Anahata has twelve of these and a six-pointed star in the middle like a Star of David. 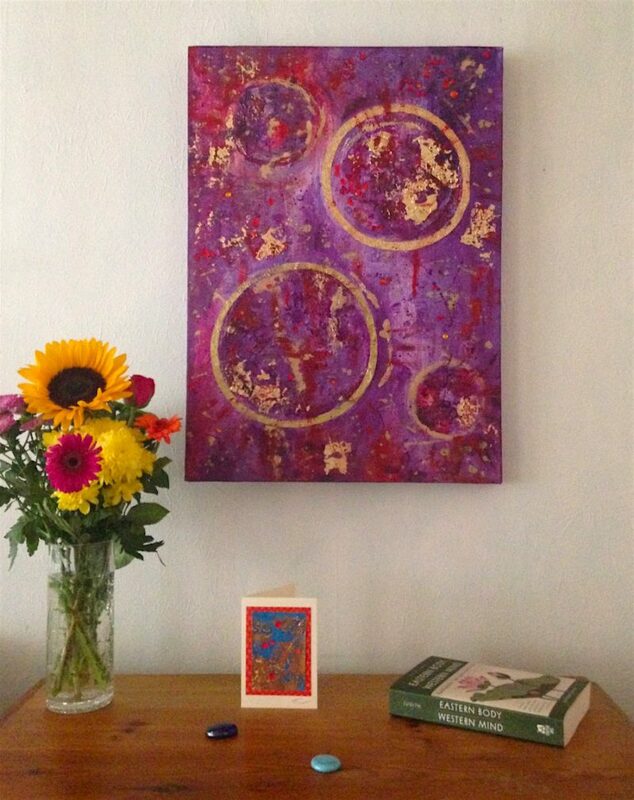 In my paintings I’m less concerned about depicting the actual chakra images than conjuring up a “feel” of them. Hence I use bright acrylics, often more than one colour if I’m considering the “influence” of two or more chakras and gold leaf. As well as the dazzling chiyogami paper that has become a feature of much of my work. 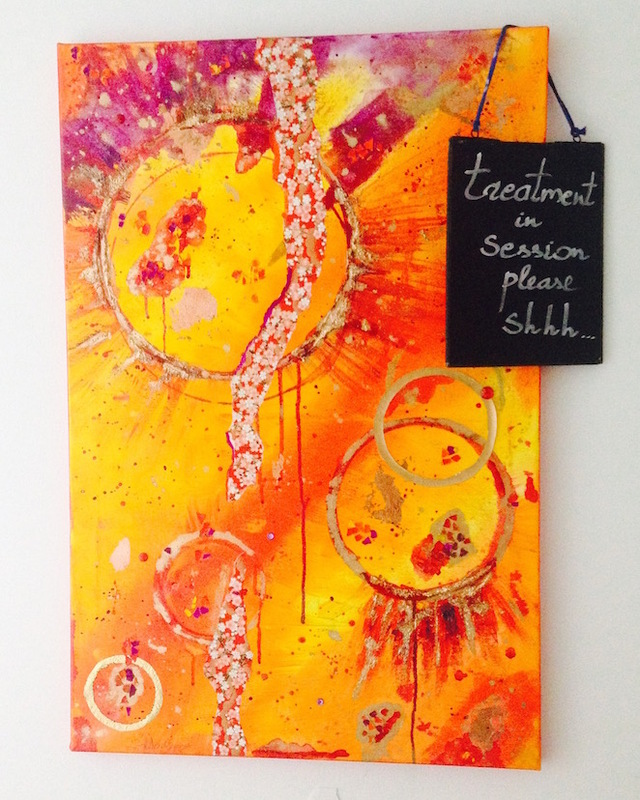 In December 2016 yoga and art teamed up for me when Tri Yoga in London got in touch. Each year they hold a charity raffle and in 2016 they were supporting the Magic Breakfast. As a former long-time Londoner and Tri Yoga visitor, I was delighted to contribute some artwork to help a worthy charity. This one aims to see children going to school well-nourished and therefore able to focus on their morning lessons. See for yourself by clicking through to their page. Needless to say, I was over the moon to see that Tri Yoga patrons snapped up all five of my works. A great gift in itself that I had a hand in helping to raise the £15 000 that will be so useful. Do you have any passions that inspire your artwork? Let me know in the comment section.